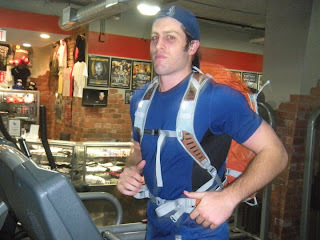 ...he's a bada$$ runner going to Conquer Atacama next week!! Oh yeah, that's the mug of a rock star! I was honored to talk to Dan on the phone the other day about his fundraising efforts and his training schedule, but I warned him that I'm no Barbara Walters...so this may be a crude recap of the interview, and I apologize in advance, Dan! But overall, it was awesome to talk to such a dedicated and driven athlete. The Atacama Crossing (Chile) is part of the 4 Deserts which was named by TIME magazine as #2 on its list of Top 10 Endurance Competitions in the world. The Atacama Crossing (Chile) 2011 is the seventh edition of the event. The Atacama Desert is 15 million years old and 50 times more arid than California's Death Valley. The entire race will be held at least 1.6 kilometers / 1 mile above sea level and cover the distance required to make a horizontal crossing of the country of Chile (250 kilometers / 150 miles). The highest altitude on the course is at Camp 1 and is 3000 meters /10,000 feet. Where does he do most of his training? 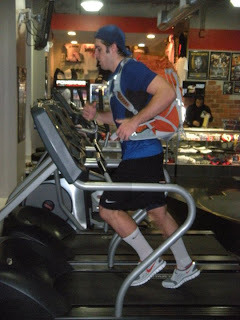 Almost all of Dan's running is done on a treadmill at a gym, with high inclines, speeds and a pack on his back for training. He tries to run at least five times per week at a 7:30-8:00 min/mile pace with his pack. And, at 6'3", he stands out quite a bit on the treadmill. What made him choose St. Baldrick's for his fundraising efforts? His uncle has been very involved with the foundation for the past couple years; he works closely with the board of directors and raises much needed funds for research. Dan's been involved with the foundation with his family but not as closely as he is now with the fundraising efforts. He's always wanted to run this race (the Atacama Crossing), so when he saw that a person can run it and designate a charity he knew he needed to work with St. Baldrick's. After talking to his uncle, Dan was set up with event coordinators to help with the fundraising efforts. He is dedicating each Stage of the event in memory and in honor of five New York area children diagnosed with cancer. At the time of the interview, Dan has raised $4200. His company, Morgan Stanley, has pledged to match whatever Dan raises. With hopes to raise at least $10,000 beyond the race, he is really close to his goal. I personally think he will bring in a lot more! Plus, once he returns home, Dan is going to shave his head in honor of St. Baldrick's! Dan's played soccer competitively his whole life, and even received a scholarship to Villanova for soccer. He was always training, always a runner. However, as soccer season came to a close during his Junior year, he succumbed to a devastating knee injury (torn ACL, lateral meniscus, medial meniscus, MCL...). After a little rehab he was able to still be active and compete at a decent level. After college ended though, he missed the competitive "fix" and started running every day after work. He was hooked. For him, running was a way to clear his mind and relieve stress--burning extra energy on a nice long run felt great. So, he started running small races, 5Ks here and there, and then completed a triathlon. Eventually he got a little tired of the shorter distances and tried his hand at military-style challenges (with obstacles), and eventually started researching more physically demanding races like ultras. Does he have a time goal in mind? Dan's a little anxious going into the race, but he'd be happy finishing in the top 25%, or at least the top 50%. His goal is to actually run the entire distance. However, there are certain aspects of the course that he cannot be prepared for, such as the altitude and terrain. To stay positive and hyped up is how he plans on staying energized for the race. Is he sponsored by anyone? All of the race fees, transportation costs, gear costs, etc., were funded entirely by Dan himself. All of the money raised will go directly to the St. Baldrick's cause! Donate HERE. The oldest mummies on earth were found in the Atacama Desert...what would he do if he found one? Name it first, but might have to leave him--it'd be extra baggage! Perhaps just mark the location and be off on his way. Dan will be documenting by taking pictures throughout the run and will try for some video footage as well. Follow Dan's journey through his Facebook page HERE. 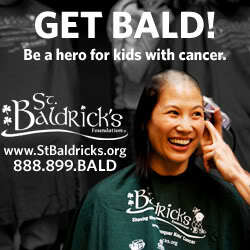 Find out more about the St. Baldrick's Foundation on their Facebook page or their website. Donate to Dan's fundraising page HERE. Thank you SO MUCH to Dan for the fun chat! Also, thank you to Melissa for setting this up! My co-interviewer, Goober, listened intently and added some gurgling insight to the conversation when she felt the need. Worked with St B's last year here in AZ! Wow. So inspiring! Thanks for highlighting him! Oh wow, what an endeavor! Good luck to Dan! Great interview, Zoe!